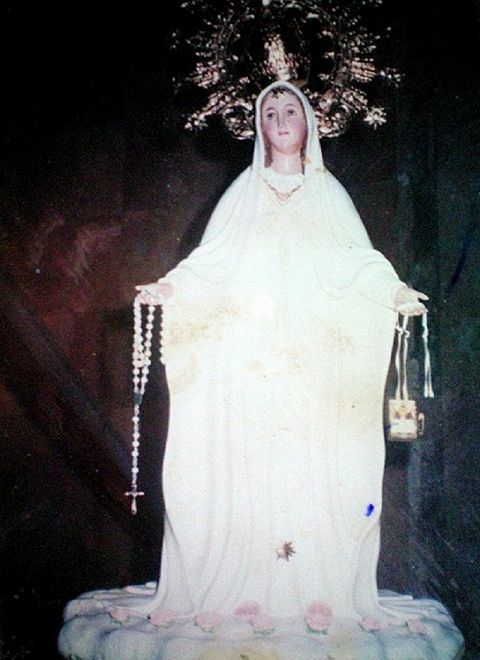 The visionary, Judiel Nieva, reportedly started receiving private apparitions of Our Lady in 1987 when he was only 10 years old and in the sixth grade. These initial visions took place in the privacy of his own home. He was the seventh child of eight born to poor parents who worked two stalls at the local market. Everyone in Agoo knew Judiel because he was reputed to have special powers – even at his age of ten. He was sought as a healer. He had reported psychic abilities – like being able to detect a non-believer, even from a great distance. (The name “Judiel” means “Bearer of God’s Mercy.”) He prayed frequently and wrote down on paper the messages from Our Lady each time she gave him some. Investigators noted that these hastily-written notes were carefully worded with near perfect grammar, seemingly beyond that of his age. Then Our Blessed Mother stood up over a guava tree on a rise, high, overlooking the spring, and spoke. Her Immaculate Heart was visible on her chest, and light radiated outward towards the spring of water – which the infant Jesus then waded in. Mary promised to visit Judiel every first Saturday and on her Feast days. She asked for other people to return also. Over 50 apparitions occurred between March 31, 1989 and September 8, 1993. As each apparition day approached, he would begin a period of fasting and meditation. During this time he would not speak to anyone or appear in public. He preferred privacy, but when in public, male friends would act as “bodyguards.” Just before the Virgin Mary would appear, her presence could be detected through the extraordinary fragrance of roses. People would kiss the ground when they perceived this. A flash of light usually preceded her appearance. Mary was “a heavenly beauty to behold.” She wore a long white dress with a long mantle which touched the cloud upon which she stood. Only her toes could be seen. At the hem of her dress was a shining star, with a brighter star on her forehead. On her head was a beautiful crown, and above the crown was a halo of twelve stars. Her eyes were bluish-brown. Her Immaculate Heart was exposed. She usually carried a rosary and sometimes a scapular. At times Mary would be weeping – sometimes tears of blood flowed profusely from her eyes. Her messages were simple and focused on praying the rosary, penance, conversion, and consecration to her Immaculate Heart and the Sacred Heart of Jesus. She also stressed humility and sacrifice. Judiel received secrets which have not been revealed. Judiel was also shown visions of heaven, hell, and purgatory. Large crowds were present during each apparition. Tens of thousands of people converged on this small community, causing traffic jams for scores of miles. Those present were often treated to spectacular signs and visions in the sky as well the “miracle of the spinning sun,” the aroma of roses, and a mysterious blue light whenever Mary would appear to Judiel. The miracle of the “dancing sun” was witnessed by many thousands of people on several occasions. First, the sun would change from its usual radiant glare to a softer glow covered by a disc. Then different colors would radiate from the sun, spinning these rays of predominantly blue, green, red, and yellow colors onto the crowds as colored discs. These colors would remain on the disc-shaped objects for a few seconds after the disc was touched. Images of angels, the Holy Family, Jesus, and Mary with Joseph would appear from the pulsating sun. March 31, 1992: Our Lady presented the “Seven Keys to Heaven” and begged Judiel to pray the 15 mysteries of the rosary, daily, while traveling, so that he would be protected from all dangers of body and soul. Visit the Blessed Sacrament often. Wear the Brown Scapular (cloth). Pray the 15 mysteries of the holy rosary with the litany and Hail Holy Queen. Do the Way of the Cross. Make Communion of Reparation on First Fridays and First Saturdays. Visionary Judiel Nieva experiencing a Eucharistic miracle; Host turns to flesh and blood in front of witnesses. August 1, 1992: An angel appeared and gave Judiel Holy Communion from a Host and a Chalice suspended in mid-air. December 13, 1992: A Eucharistic Miracle was witnessed by Father Cortez and nuns at the convent. A statue of Mary, carved according to Judiel’s description of her, was brought to the convent and shed tears to the amazement of the nuns and Father Cortez. When Father Cortez placed a Host on Judiel’s tongue, witnesses reported that they saw it “turn into flesh and blood.” When Judiel went back to his pew after communion, he felt liquid dripping from his mouth. Then the Host swelled in his mouth, and the person next to him alerted Father Cortez, who urged him to spit it out. The Communion Host had transformed into pulsating flesh and blood. Father Cortez wanted to preserve this Eucharistic Miracle, but Our Lady intervened and said that Judiel must swallow it. As a concession however, the nuns were allowed to press and imprint the bloody Host onto their white handkerchiefs. Each nun did receive an imprint on each handkerchief. Then Judiel put the Host back on his tongue – at which time it slowly turned back into a white host — just before he swallowed it, according to witnesses. When Father Cortez asked him to open his mouth afterwards, there was no trace now of blood, flesh, or the host. 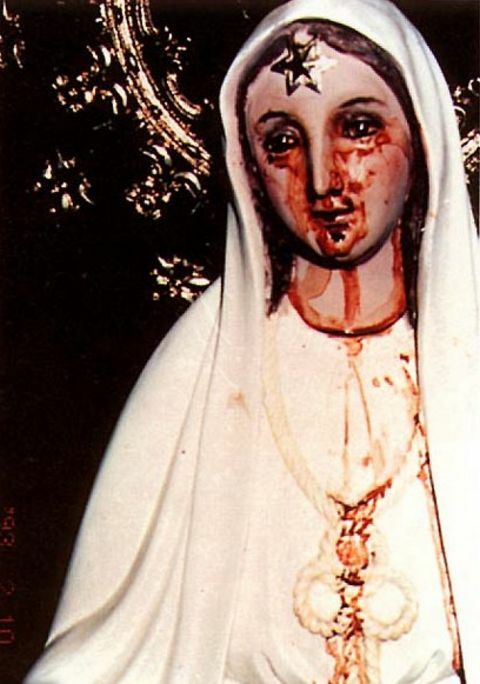 The weeping blood of the Virgin’s statue in Agoo. The observing bishop placed his fingers in it. February 11, 1993: Reported by cloistered nuns, a six-year old boy — who had been born blind – had his sight miraculously restored during the apparition on this date. This was the first documented healing associated with the apparitions. The weeping statue was also attributed to two unexpected healings of a high official’s critically ill wife. Interest had grown tremendously in the apparition occurrences to the point that countless thousands started gathering in the days preceding an event. On March 5, 1993, the day before the next apparition, a Manila Bulletin reporter covering the events said that he personally witnessed “a spinning and dancing of the sun” for about 15 minutes. And at dawn of the apparition day, “the sun again moved and danced” for a brief time. March 6, 1993: It is estimated that one million people gathered that day for the anticipated apparition. The crowd included top Philippine government officials, journalists, and the local bishop – acting as a representative for the Pope. Father Cortez conducted a noontime Mass at “Apparition Hill” with this massive assembly. At one point Father appealed for silence from the crowd, calling for them to feel the presence of Christ in their hearts. Suddenly, the silhouette of the Virgin Mary appeared for five seconds above the guava tree. Two government officials, the Speaker of the House and the Senate President Pro Tempore, attested to seeing this manifestation in Agoo. A radio reporter, Mon Francisco, described the apparition to listeners of Manila radio station DZXL. About ten minutes afterwards, Judiel was reading a message he had just received from the Virgin when “lights of different colors came from various directions and moved toward the sun,” according to the Manila Bulletin. Her message asked for Catholics to pray for the children of famine-wracked Somalia. Judiel announced that the next and last apparition would be on September 8, 1993. Bishop Salvador Lazo also experienced the phenomenon. He created a commission to investigate, gather evidence and testimonies, and report to the Vatican on the events. Scores of miraculous cures have been attributed to the water spring at the apparition site. Despite all of these details, witnessed miracles, and public events, the commission created by Bishop Lazo condemned everything without explanation – giving only reference to alleged financial misdoings by the visionary’s family and Judiel’s own personal gender identity issues – seemingly unrelated concerns that should hardly dismiss all that occurred in Agoo of a supernatural nature. Because of politics and unfair biases, this series of remarkable events, well-witnessed by thousands, remains relatively unknown because of the abrupt dismissal.